After successfully making your photos look better, Google (s GOOG) is now taking on your shaky mobile phone videos: The company introduced automatic video editing features at a press event in San Francisco Tuesday, allowing users to turn clips that they recorded with their phones into small, sharable videos, complete with a soundtrack and effects. Auto-awesome for videos takes single clips, identifies key scenes, adds image stabilization and other effects and even a soundtrack based on licensed music that can be legally shared. Users can either leave everything to Google’s algorithms or decide to manually tweak the result by making videos longer or shorter, swapping the soundtrack and applying different video filters. In many ways, auto-awesome for video resembles some of the features offered by startups like Magisto, which just announced a new round of funding earlier today. 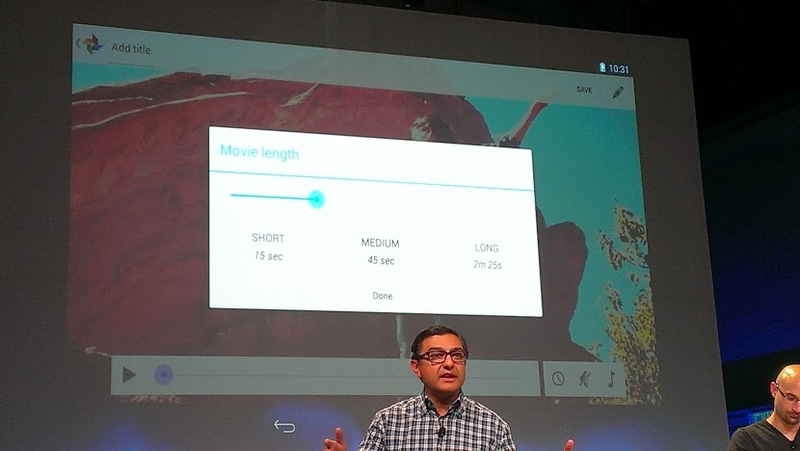 Automatic video editing – with an option to go back and change settings like the length of a clip. Google also introduced a number of new photo editing features Tuesday, which are also automatically applied to any photo uploaded to Google+. One of the most impressive features automatically removes people in the background of your photos — think of it as a secret weapon against photo-bombing. And the company announced a number of new filters for its Snapseed mobile app as well as its Nik filter collection for professional photographers. The continued focus on photos and videos shows that Google believes media to be the key to turning Google+ into a real success. Google SVP Vic Gundotra said Tuesday that Google+ users now upload 1.5 billion photos each week to the service, no doubt thanks in large part to auto-upload functionality in the service’s mobile apps. The Google+ Android app has been offering automatic backup of images in the background for some time, and Google announced Tuesday that background uploading is soon coming to iOS as well. 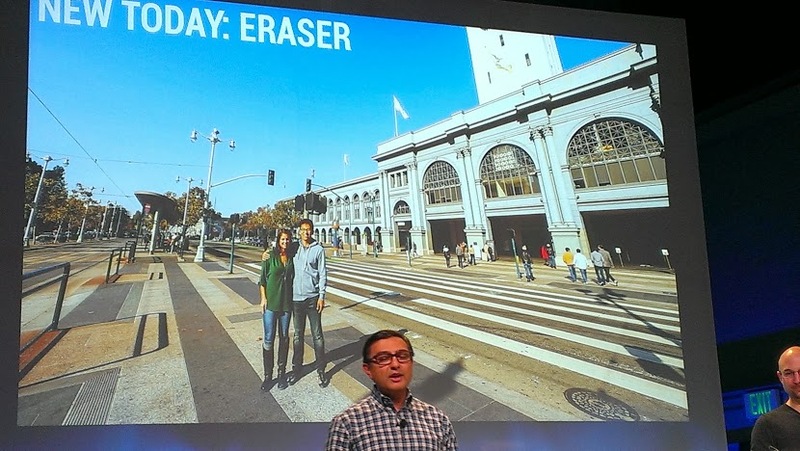 Google’s secret weapon against photobombing: auto eraser. The company also added a few updates to its Hangouts messaging app: Users can now easily share their location with the press of a button. Hangouts is also now integrated with SMS messaging, allowing users to text and send Hangouts messages from within the same app. Gundotra said that the goal was to have “one place for all of your communication.” And finally, animated GIFs are now available in Hangouts chats. Google also updated the Hangouts video chat experience by making HD hangouts available to all users across all devices — a move that is part of a bigger shift towards the VP8 video codec and WebRTC as a real-time communications protocol, allowing Google to run Hangouts in the browser without the need for any additional plugin. And to improve the video quality during a call, Google is automatically applying filters to fix bad lighting – something that Gundotra compared to the auto-awesome filters for photos and videos. Gundotra said Tuesday that Google+ now has 540 million monthly active users, with 300 million of them participating in the stream. the shaky fix on you tube are awful and corrupt the upload… out the six that I have tried all went into delete..
To be honest, I am always on the lookout for some awesome editing software . Hope Google plus will be more better than other social sites. To be honest, I love these new Google products!!! That was impressive. G+ right now is much better than facebook in functionality and options. It seems to have a bright future as well.